SuperFogeys - SuperFogeys Issue 3 Now Available on Comixology… and Other Announcements! 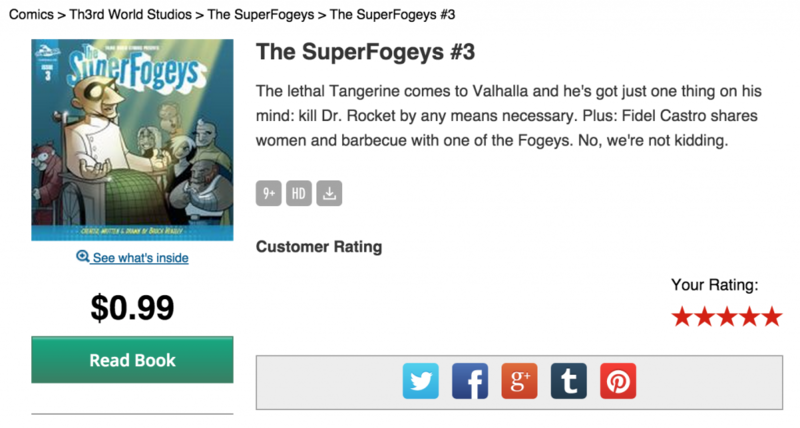 SuperFogeys Issue 3 Now Available on Comixology… and Other Announcements! Many of you have been asking about this for a while now and I’m pleased to report that the next issue of The SuperFogeys just went live on Comixology! Issue 3 collects both Chapter 5 “The Redemption of Dr. Rocket” and Chapter 6 “Funeral for a Frenemy.” Chapter 6 has actually NEVER before been collected anywhere, in print or otherwise. What I love best about Comixology is the option to read a panel at a time. It’s an experience entirely unique to the digital medium and, for those of us familiar with the story, I think it makes it fresh again. More issues on the way very, very soon. I’ll keep you guys posted. • It’s been decided: we’re moving to a 3-times-a-week schedule. I know we promised that upon our return in June we’d go to 5-times-a-week, but what I’m hearing from both our patrons on Patreon and those of you who would like to pledge is that 3-times-a-week would be more agreeable. So, there we go. Done. • I continue to do everything I can on Patreon to make the wait until our return in June easier. Just yesterday I posted an early peek at SF 659, the 14th strip in the upcoming Chapter 20. I highlighted this one in particular because it’s a good example of how the collaboration between me and Marc works–and works well. That’s it for now! If you want to find out more about the SuperFogeys Patreon and see the video I made (and, sadly, starred in) to tell you all about it, click here. SuperFogeys - The SuperFogeys is Now on Patreon!